BMWs are world renowned as one of the top luxury car brands available on the market. European engineering combined with finely designed details means you are driving a work of art. BMWs are built to last a lifetime, and the selection of used BMWs for sale at Moss Motors BMW in Lafayette, LA, is sure to impress. For years, we’ve been the area’s leading used BMW resource, providing our customers with detail-oriented, dependable service. Avoid the hassle of buying a used vehicle from an unknown source. All of our vehicles are certified pre-owned BMWs, meaning they have passed rigorous QA tests and are ready for the road. For more information on our inventory, give our office a call or stop by our showroom today. We look forward to serving you. When people think BMW, they think luxury and elegance. Unfortunately, sometimes that also comes with a hefty price tag. At Moss Motors BMW, you’re in for a different buying experience. Our lineup of certified pre-owned BMWs is always priced at the most competitive rate possible, meaning you are getting an amazing deal for an incredible machine. Driving a BMW is different, and getting your hands on one of your own has never been easier. Our inventory is constantly getting updated with the best models from the last few years. Our mechanics specialize in servicing BMWs so you know you are getting a reliable, high-performance car as soon as you drive off the lot. From start to finish, you’re in good hands at Moss Motors in Lafayette. Our entire team is extremely knowledgeable and can offer guidance on which BMW is best for your lifestyle and budget. Our used vehicles aren’t merely junkers that will break down in six months—they are quality cars that will stand the test of time. Our inventory is stocked with low-mileage premium automobiles that have been well taken care of and expertly restored. We place a great emphasis on giving you the ultimate luxury experience, with the added bonus of a reduced price. BMWs are some of the best-made vehicles on the road, and our selection speaks for itself. Are you in the market for a luxury vehicle but don’t want to pay top dollar? At Moss Motors BMW, we make the buying process easy and transparent, so you’ll end up driving off our lot with a gorgeous car in under an hour. We work hand-in-hand with our BMW technicians to ensure each vehicle in our showroom lives up to the BMW standard. Luxury and sophistication can be yours without paying exorbitant prices when you shop for a used vehicle at Moss Motors BMW. 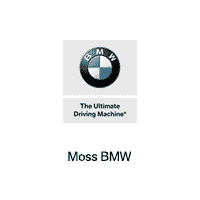 For a great selection of used BMWs, contact Moss Motors today!